Happy New Year's Eve! 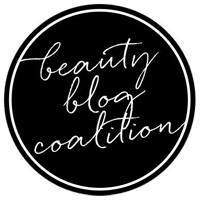 I have another favorites post for you - this time for my favorite indies of the year! The indie industry has exploded this year and it was so hard to narrow down this list. I attempted to keep it at 12 but that was impossible. I am actually not sure how many I ended up with. LOL! Let's just drool over the lovely pics. *While I have worn all of my favorites, I haven't had time to post all of them here. Because of this, I have borrowed some photos from the lovely Sheila at Pointless Cafe. Dandy Nails Cashmere Night - this lovely purple matte with shimmer and micro-flakes is one that captured my heart the instant I put it on. 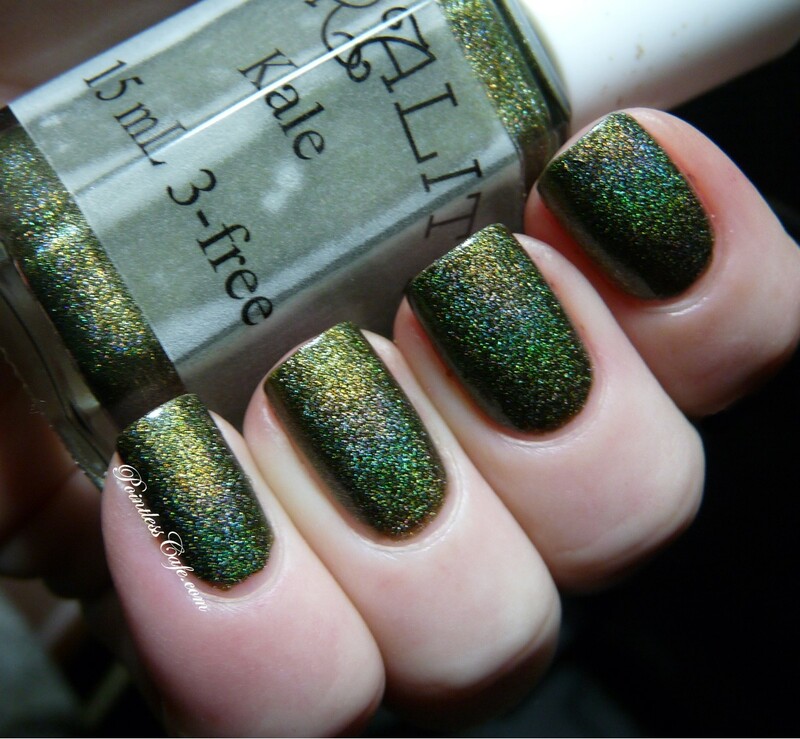 Chirality Kale - it's an olive green holo. Need I say more? I think not. Elevation Polish The Arches - such a yummy, cozy color. I just love this one - and it has a perfect formula. 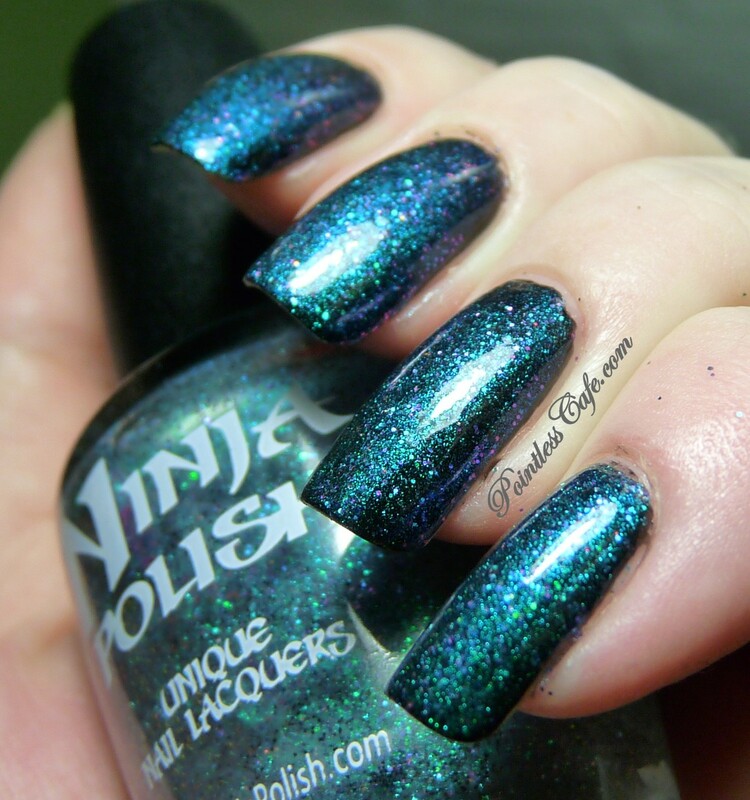 Ninja Polish Howling Blue Moon - blue glow in the dark polish packed with shimmer and even, what else, moons!! NerdLacquer Holy Grail - I haven't had a chance to post this one (and I was hoping to take some better photos of it) but I just had to include it in this post. Maya Tranquillis - Such a lovely shade of deep blue packed with bronze shimmer. Red Dog Designs Mele Kalikimaka - I also haven't posted this one but it is shown here over Dior Amazonia. I love the combination of these glitters! Dandy Nails Mighty Fine Print - I don't usually go for black polish but the way the red and white glitter pops in this one made it a stand-out for me. Enchanted Polish Hot Chocolate - Enchanted Polish has really burst onto the scene this year and her holos are simply stunning. I love this chocolate brown one - so rich. Ninja Polish Alexandrite - I actually did an amazing mani with this one that had snowflake stamping on top - but I didn't get a chance to take photos of it. Luckily, Sheila's pics show it off amazingly. Sea Lore Attina - such a juicy colors packed with shimmer and micro-flakes. NerdLacquer All of Time and Space - Green and purple yumminess with a Doctor Who-themed name. You can't go wrong with that. Ninja Polish Zultanite - this one is my favorite from the Facets line. I just love the colors and all of the shifts. AquaDaisy Shazaam - perfect one-coat purple holo. I love this one so much. I so totally agree with you on so many!! This is a really nice assortment of polishes to pick as favorites! Howling moon glows in the dark... Awesome. I csn't wait to wear that one.. Awesome job Ashley! !